We have worked with Click Travel since 2007; first handling their rebrand, and have been creating ongoing communication, exhibition graphics and videos for them ever since. 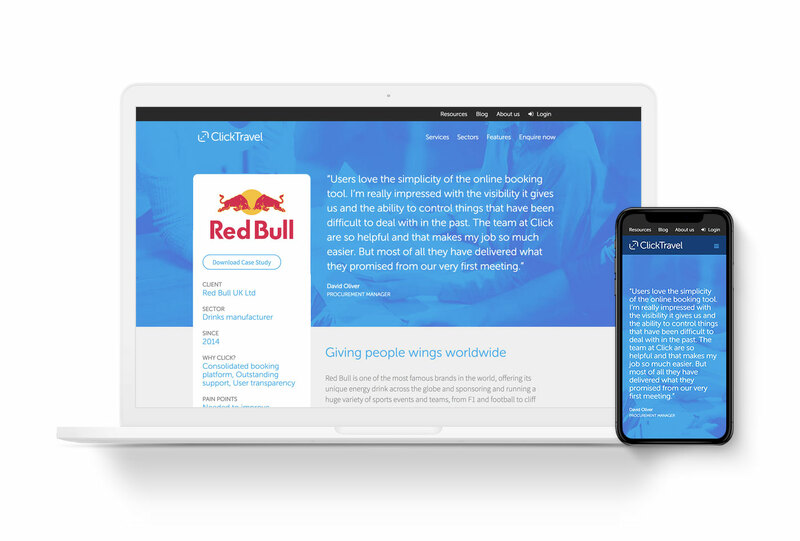 Along with their industry leading booking tool travel.cloud (which has now been spun out as a standalone product) we have worked with Click Travel as they have grown to the award-winning business they are today. At the beginning of 2018, and following the rebrand of their core product travel.cloud, we updated their brand too. Only a slight variation from the original brand we created back in 2007, this moved to a leaner, smoother iteration of the identity. Having designed their responsive CMS website in 2015, we worked on a new build for them in 2017, moving to the WordPress platform. With almost 100 pages and a migration of over 300 blog posts, the whole project had a turnaround of just 4 weeks. Included in this were several customised modules for their Case Studies and Resources, new graphics and icons throughout, as well as setting new image styles which varied for each section. …huge thanks to everyone involved at your end. A fantastic achievement in such a short timeframe! Included in the new build were integrations to Pardot to generate various workflows from the contact forms. We included some extra security measures to keep the spam out and streamline the whole process for their marketing team. You’ve made this so straight-forward and your support has really been appreciated! 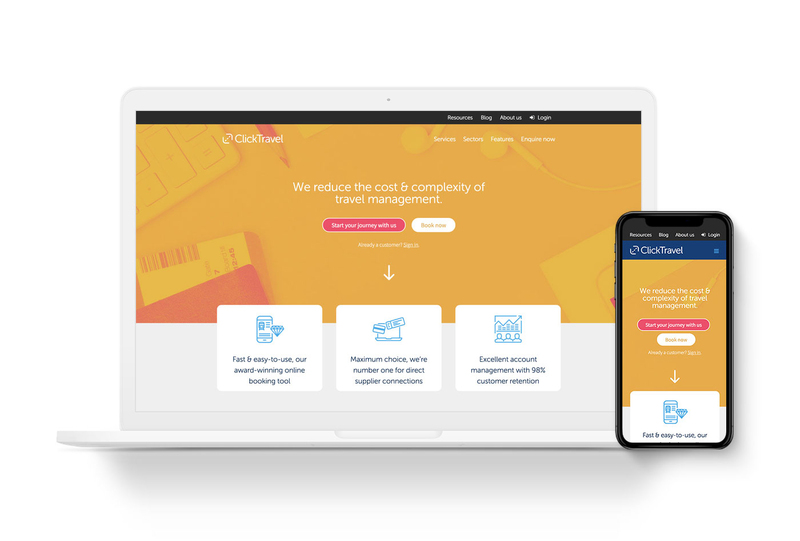 The customised case study templates gave Click’s marketing team the control to continue adding them in-house – one of the many benefits of a great CMS system. A bespoke module within gives the simplicity they need coupled with the familiar controls WordPress offers natively. As the site grew, we added in bespoke landing pages to generate more leads. 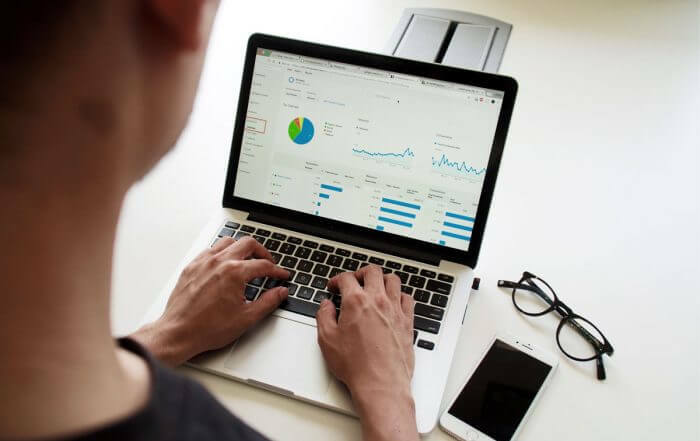 The Ask For More campaign tied in with their 2018 Business Travel Show presence and tracked unique visitors from the campaign, offering them a download for insider tips in Business Travel. We also worked on the accompanying brochure which was distributed at the show. To tie in with the new website campaign and their stand at the Business Travel Show, we developed a storyboard and produced a video to capture a day in the life of the business and their employees. We spent a couple of days on location in Click’s offices and around their home city of Birmingham, getting a taste for their different approach to business travel and experiencing why they’re one of the Sunday Times 100 Best Companies to work for. Playing on the Wii, sharing a pizza and having a laugh in-between shoots was all part of the fun! Having worked with Sam and the DeType team for some time, I can safely say he’s been the most creative, responsive and consistent designer I’ve had the pleasure to work with. From web design to sales collateral and stand design, Sam has really helped us build our brand and look our best, offline and online. Are you looking for a bespoke CMS website for a medium to large business?